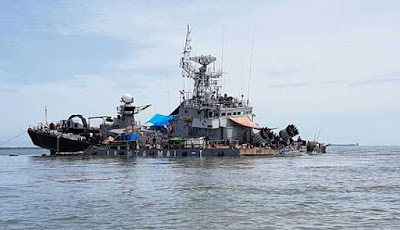 The Indonesian Navy (Tentara Nasional Indonesia - Angkatan Laut, or TNI-AL) has launched a formal enquiry into an accident that has partially sunk one of its Kapitan Pattimura (Parchim I)-class corvettes. The vessel, KRI Pati Unus, was sailing from the Malacca Strait towards the port of Belawan, Sumatra on 13 May 2016 when it hit an underwater object believed to be the remains of a ship that has wrecked near the port entrance. The TNI-AL only confirmed the incident in late May after images of the stricken vessel spread online. 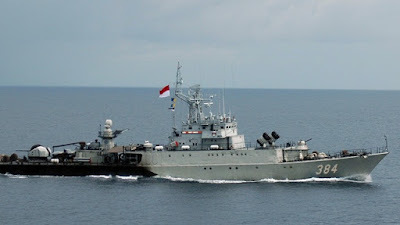 A TNI-AL Western Fleet (KOARMABAR) source has also since confirmed with IHS Jane's that the corvette was not on an authorised route into the port and that an assessment into the vessel's damage has begun in tandem with accident investigations. Bearing pennant number 384, Pati Unus is an ex-German Democratic Republic ship that was originally inducted into the East German Navy in July 1983. The vessel was re-commissioned into the TNI-AL in July 1995. The TNI-AL operated a fleet of 16 ships in the class from the mid-1990s before KRI Memet Sastrawiria (380) was damaged by fire in 2008 and subsequently decommissioned. The service was however not able to comment on the extent of Pati Unus ' damage or confirm if the ship will also be retired.